The Ilankai Thamil Arasu Katchi(ITAK)formed in 1949 is currently holding its 3-day long 14th national convention in Batticaloa town. The ITAK is presently the chief constituent party of the Tamil National Alliance(TNA) which contests polls under the ITAK symbol of House. Other constituents of the TNA like EPRLF&TELO have been clamouring for registration of the loose alliance as a separate political party. The ITAK being the single largest party in the TNA alliance with a majority of MP”s&local authority representatives has resisted such moves. Staging the convention in Batticaloa is a demonstration of the ITAK’s resolve to maintain its separate identity without losing it to”TNA”. Veteran Politician&Trinco district MP Rajavarothayam Sampanthan was unanimously re-elected as President of Ilankai Thamil Arasu Katchi(ITAK). 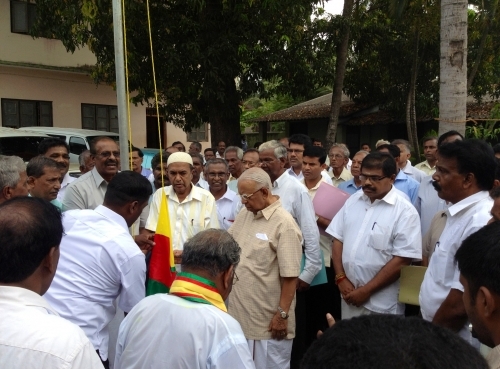 Senior Parliamentarian Somasuntharam Senathirajah was re-elected as party General Secretary. He is widely known as “Maavai” Senathirajah. TNA National list MP & lawyer Mathiyaparanam A. Sumanthiran was elected secretary in charge of the party’s’s legal & external affairs division. Ex-school principal & Jaffna dist MP Sivagnanam Shreetharan was elected propaganda secretary of ITAK. Newspaper “baron” & Jaffna district MP E.Saravanabavaan was elected ITAK secretary in charge of rehabilitation & resettlement matters. Temple trustee & Batticaloa dist MP Packiyaselvam Ariyanenthiran was elected Trade Union secretary of the Ilankai Thamil Arasu Katchi. Hindu religious activist & Batticaloa district MP Seenithamby Yogeswaran has been appointed party secretary for Cultural affairs. Eight vice – presidents representing the 8 districts in the Northern & eastern Provinces & a twelve member working committee were also elected. The party office-bearers were elected through the General Council.The newly elected will be ratified at the ITAK’s public general meeting. The ITAK convention in Batticaloa is being held amidst opposition from Tamil Makkal Viduthalai Puligal (TMVP) led by chief minister Pillaiyan. The Ilankai Thamil Arasu Katchi (ITAK) had to change its Convention venue in Batticaloa due to firebombing of the previously arranged hall.